log home with detached guesthouse. Free Wifi and Satellite TV! 3 bedroom house with 1 bedroom detached guest house. 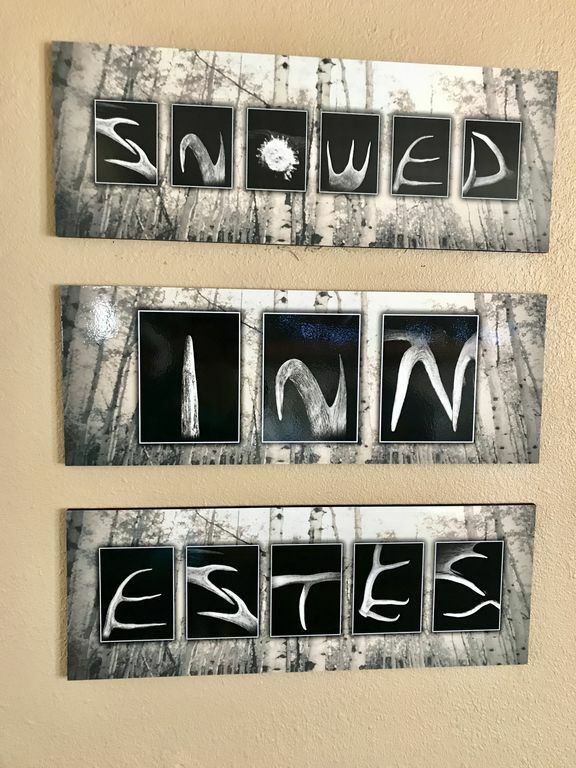 Snowed Inn Estes is located 5 miles from downtown Estes Park in Meadowdale Hill on nearly two acres. Meadowdale Hills is 4 miles from Lake Estes near Highway 36. The main house is a three bedroom home with two large bedrooms one with king size log bed, and other has a queen size bed. The smaller bedroom has two twin beds. A total of sleeping for six. The detached guest house is one bedroom with queen size bed with sleeping for two. Discount if your guest count is 6 or less and don't use guest house. Total guests 8 Maximum for both. Snowed Inn is professionally designed and furnished with the combination of rustic elegance. Log siding with river rock accents and log covered porch and log interior's. Knotty-pine floors and knotty alder kitchen cabinets and solid core knotty alder interior doors, granite countertops, stainless-steel appliances including microwave, conventional and convection oven, and an island cooktop and bar make this a dream kitchen. Free WiFi with free continental US long distance. 42' LCD HDTV in living room in main house and HD Home Theatre system with IPOD dock. Many condiments and spices included making your cooking experience and shopping expenses more affordable. The main bath has a 60' shower with river rock surround for a rustic decor. One 4' step in the house makes it easily accessible for elderly or partially handicapped. The main bath has a 4' step to get in the 60' shower, and the toilet in the main bath is extra high for handicapped. Slab granite countertops in bath with custom concrete vessel sinks. Play pen, high chair, and booster chair for babies and toddler's. The house being outside the Town of Estes has a well and septic system. The main house has one shower in the main bath and one jacuzzi tub in the master bath. The guest house has a tub/shower combination. 4 outdoor decks provide places to enjoy a panoramic view of the Rocky Mountains. The front deck is covered with comfortable outdoor furniture. The back patio has an outdoor table and chairs and lounge chair. The guest house has it's own private deck area, and flagstone patio. Front deck has log furniture and unobstructed view of mountains. Holidays, Thanksgiving, Christmas, New Years are booked at peak season rate even though the auto quote may not pick it up. Your auto quote will not reflect the holiday rate. We turned our family cabin purchased in 1986 into a vacation rental in 2002. We totally remodeled inside and out and designed with a professional designer to get all of the touches that make your stay more enjoyable. My husband, Dan and I live in Fort Collins, an hour away from Estes and do all of our own cleaning, maintenance,and improvements to make sure everything is perfect for your stay. I know you will love our warm and cozy home and the privacy the location offers. Estes Park is just an hour away from our home, a great place for us to get away to one of the most beautiful places in Colorado. We originally built in 1986, remodeled in 2002, and continually work to improve the quality of the rental. Meadowdale Hills is a small subdivision with lots at nearly 2 acres with quiet and space. Elk love the meadow and ranch nearby and frequent our property. Our home is only five minutes from downtown Estes Park making the location convenient but not in a crowded subdivision in town. My front porch is spacious with views that are inspiring. I provide many amenities so you don't have to pack so much for your trip, including condiments, spices, flour and sugar, robes, bag chairs for a picnic and many other items. Long distance included. Sprint booster for cell phone use. 3 bar stool seats at island as well. Wheelchair will not fit into bathroom doors, but one easy 4 inch step up into ranch style house. We enjoyed our time in your cabin immensely. The cabin was decorated for Christmas and was to charming. Everything was charming and so cozy. We rented the guesthouse in addition to the cabin, and it was equally charming. Just loved the den/kitchen in the guesthouse. Both my teen-age granddaughter and my 89 year old mother took turns spending the night in the guesthouse, and both enjoyed it thoroughly! All beds were very comfortable! Working with the owner through the entire process has been so easy and comfortable! Thank you Cheryl! Thank you from your kind words regarding your stay in my home. It was a pleasure having “Santa” stay too! Thanks for leaving the house in wonderful shape at check out. We thoroughly enjoyed our stay in this home. Very inviting and cozy! Very comfy beds and loved the openness of the living and kitchen area. Enjoyed evenings on the front porch and the quiteness in the general area. Highly recommended!! Thank you so much for your kind remarks. I am so glad you enjoyed your stay in my home, It was such a pleasure to rent to your family! Loved the place... Great location! The cabin was extremely well stocked for anything you'd need to make your stay as comfortable as possible. We had breakfast on the porch every morning. Cheryl was very quick to respond to our questions. Thank you so much for your wonderful review. I hope you will join us again at Snowed Inn on your next trip to Estes Park from Kansas! Very impressed! This was a great place for our family to enjoy our time together in a comfortable setting as opposed to having to struggle in meeting one another in a hotel lobby. Beautiful view, inside and out! Thanks so much for your kind words. I am glad you enjoyed your stay during the Scottish festival. We enjoyed our stay at Snowed Inn. It was very clean, quaint and well equipped. Our problem was that we could not get into the house when we arrived because the lock box didn’t work. We tried calling both numbers but no one responded. We had to enter by climbing through a window. We did hear from the owner that evening but we had to keep the house unlocked all weekend. So sorry our new lock box had failed to open. I did not even see that I had a missed call until late as I was attending a middle school function. I responded by email immediately as I receive texts alerting me. I was relieved that you were resourceful as we had left windows open as we had been there shortly prior to your arrival. Snowed Inn Estes is located 4 miles from Lake Estes near highway 36 in Meadowdale Hills. Meadowdale Hills is across the highway from Hermit Park, formerly Hewlett Packard property, now currently owned by Larimer County. Ski: Cross country skiing and snowshoeing areas are close by in Rocky Mountain National Park. Downhill skiing near Boulder at El Dora or Summit County skiing is 2 hours away. Off peak season rates include a mid-week rate (Sunday - Thursday) of $175 per night for the main house. Peak season rate for the guest house is $100 per night, off peak is $75 per night. Holiday rates are the same as peak seaon.